GALION — October 27, 2017 was just a normal day for Galion’s Becky Garverick. It was a cool. It was autumn. She decided to mow her lawn for possibly the final time for the season. After completing her lawn, Becky decided to help out her busy neighbors Troy and Denise Evans and mow their yard as well. Hannah Evans, 19-year-old daughter of Troy and Denise, was home prepping to leave for her job at Kohl’s in Mansfield. She had looked outside and saw Becky mowing while she was getting ready. When Evans looked outside a few minutes later, she watched as Garverick dropped to the ground lifeless. Without hesitation, Hannah ran outside to Becky. The lawnmower was still running beside her where she had collapsed on the grass. Hannah immediately went to work finding Becky’s pulse, but it was very faint. She started chest compressions and dialed 911. “At one point while doing CPR, I lost Becky’s pulse. But I just kept going,” she explained. Evans, a nursing student at NC State in Mansfield, had learned CPR while she attended Pioneer Career and Technology Center as a medical technology student. She graduated from Pioneer and Galion High School in the Spring of 2017. 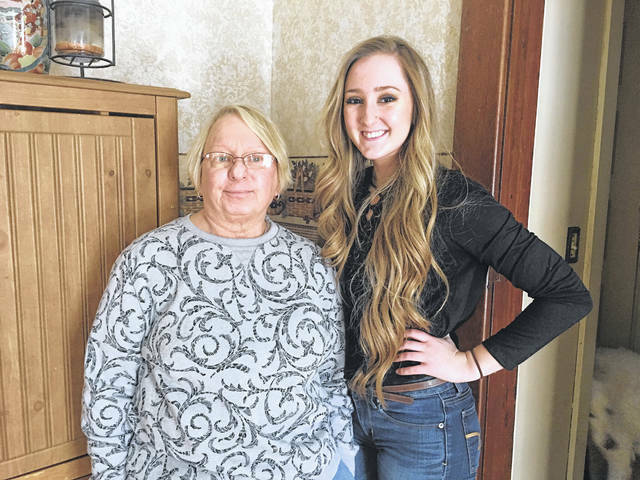 Hannah had never performed CPR on an actual person until that day, and if she hadn’t been trained to do so, Becky Garverick knows she would not be here today. After the Galion EMS crew arrived and transported Becky to the hospital, she was then flown to Riverside Hospital in Columbus where she spent the following month recovering from surgery to clear an artery with 100 percent blockage. Two platinum stents also were need to clear arteries. Once released from Riverside, Garverick spent three weeks at Mill Creek Nursing and Rehabilitation in Galion before she was finally permitted to return home at the end of January 2018. The Evans family kept up with Becky’s recovery with updates from her sons Tom and Ben Garverick. Garverick remembers little to nothing of the day she had her heart attack, and she is thankful she doesn’t. She also is thankful for Hannah. “I am also thankful for all of Galion, who helped with my heart attack. The paramedics, the neighbors, and many churches who had me on their prayer chains,” Becky continued. “For the many friends and family who visited, called, or send gift and prayed. Erin Miller | Galion Inquirer Becky Garverick and Hannah Evans, neighbors on Galion’s Erie Street, pose for a photo last month. Garverick wanted to thank Evans personally for helping her last year when she had a heart attack. https://www.galioninquirer.com/wp-content/uploads/sites/38/2018/03/web1_28767693_10213280400342872_903629558_o.jpgErin Miller | Galion Inquirer Becky Garverick and Hannah Evans, neighbors on Galion’s Erie Street, pose for a photo last month. Garverick wanted to thank Evans personally for helping her last year when she had a heart attack. Email Erin Miller with story ideas or photo ideas at emiller@aimmediamidwest.com or call her at 419-468-1117, ext. 2049.